Sector leaders have complained about “patchy” government support for providers joining the battle against the radicalisation of learners, after a survey indicated that 45 per cent of FE staff were not trained for the task. From September 21, FE institutions will be subject to the prevent duty, which requires them to put policies in place to prevent potential radicalisation of learners and exposure to extremism. But the results of a new survey of Association of Teachers and Lecturers (ATL) members working in English FE colleges, which was published on Friday (September 18), indicated that 45 per cent of those questioned had not had any training in how to stop students being drawn into terrorism. The survey, carried out with 157 respondents at the end of last term, also indicated that 29 per cent of staff were not aware that FE colleges would be subject to the duty. It comes after the head of MI5, Andrew Parker, warned on BBC Radio 4’s Today programme on Thursday (September 17) that the terrorist threat to the UK was now rated as severe, meaning an attack is likely. Chief executive of the Sixth Form Colleges Association (SFCA) David Igoe said: “We welcome this report from ATL, highlighting, as it does, the lack of preparation for staff who are at the front line in exercising these duties. He added that “SFCs have been kept informed by the SFCA of the new prevent duties and the training available and most have undertaken staff training to support this. “Our other concern is the role of Ofsted in monitoring colleges’ preparedness and response to the new statutory duty. But he added that there had been “a relatively short timeframe for colleges to prepare for the duty”. “This is no easy task but AoC has provided training, conferences and webinars to help colleges,” he said. Stewart Segal, chief executive of the Association of Employment and Learning Providers said that his organisation had been working “to ensure that providers have the resources available to respond effectively to their prevent responsibilities. Security Minister John Hayes, who visited Westminster Kingsway College (WKC) on Thursday (September 10) to discuss the prevent duty with a number of London college leaders including WKC principal Andy Wilson, told FE Week that good progress had been made with training. Mr Wilson said: “We discussed [with Mr Hayes] how colleges engage and re-engage young people who might otherwise have limited contact with institutions which help them avoid radicalisation. But he added: “We talked about how resource intensive the process of identifying those who might be vulnerable to radicalisation was because any changes in behaviour are often subtle. An Ofsted spokesperson said: “We will assess the extent to which FE and skills providers are protecting learners from the risks of radicalisation and extremism. “They should make sure their staff know what to do when they have concerns. The duty places a responsibility on providers to have “due regard to the need to prevent people from being drawn into terrorism”. Meanwhile, government guidance on the issue states that ‘prevent’ is designed to deal with all forms extremism that can popularise views “which terrorists then exploit”. A Home Office spokesperson told FE Week that a “significant” amount of staff training had already taken place in the FE sector, “predominantly through the network of regional prevent co-ordinators (RPCs)”. “There are 10 RPCs for FE and higher education in place across England and Wales working with colleges and universities to help them identify the risk of radicalisation on campus by supporting institutions to put in place appropriate policies and practice,” she added. 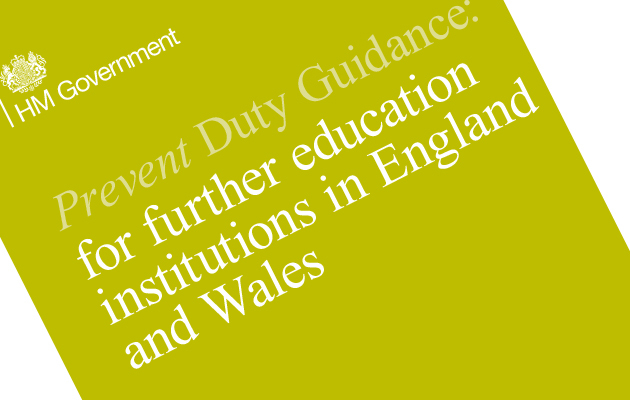 Organisations offering guidance on the duty include the Association of Teachers and Lecturers, which has released a fact sheet outlining the duty and its implications for FE. The 157 Group has also published an online tool kit which explains the different education and training organisations tackling extremism. A 157 Group spokesperson said: “Preventing people from being drawn into terrorism has never been more important. The University and College Union has released a guide for all of its members about how the prevent duty applies in the FE sector and lists the main points that institutions are expected to carry out. The points include demonstrating that staff have undertaken appropriate prevent duty training and have procedures in place for sharing information about vulnerable students. FE Week reported five months ago that the Education and Training Foundation (ETF) had unveiled a new website to help FE and skills providers stop learners falling prey to radical terror groups. The website, officially unveiled on April 17, is called Prevent for Further Education and Training: Complying with the Prevent Duty. The ETF is offering a number of free online training modules for the prevent duty, for example covering practitioners, support staff, leaders and managers, and board members. A spokesperson said that “already 4,700 individuals from governors to support staff have used it [the module service]. The widespread sector support that has been expressed for the prevent duty is to be welcomed. However, the Association of Teachers and Lecturers survey suggests that there may be a problem with the preparations of colleges for this. The complaint by the Sixth Form College Association that training has been ‘patchy’ is also worrying and the Association of Colleges was right to say that the timeframe for complying has been somewhat truncated. However, the government is right to get FE involved with the battle against extremism. It is now our duty as a sector to pull together and move pillar and post to ensure that we are in the best possible position to root out trouble to the best of everyone’s abilities. We owe it to all the talented staff and students who make our colleges and independent learning providers the diverse and welcoming places that they are. Their safety must always be the number one priority and the warning from the head of MI5, Andrew Parker, that a terrorist attack is likely throws it all into sharp focus. this also comes in the context of continuing cuts to ESOL (English for Speakers of Other Languages). How does the government answer the charge that they talk of “inclusion”, yet make it more difficult for people to learn the language of the country they are living in?